To make this haunted house cake, FIRST: I made six chocolate layers of round cake. two for each size. SECOND: Stack each size with the same size and icing in between then carve at a slant. each layer will be different. THIRD: On top of the largest size cake put medium then put small on top of medium. FOURTH: I put four sticks right down the middle because with the cake being at a slant I wanted it to be very steady. FIFTH: Icing with black all over cake. I had used a tool that made the lines. let cake sit for just a little until icing gets stiff. SIXTH: While cake is sitting take your fondant white and roll out not to thin kind of thick. use ghost cookie cutter to make your ghost shapes. after ghost are cut use eatable glitter and dust all over the ghost. I had free hand the witch or you can use a cookie cutter. I had used icing to paint all on which. You can use any round kitchen object to make the moon. SEVENTH: With grey icing start piping with the smallest tip you out line of the house starting with bottom piece and work your way up then pipe your door and windows. outline the grey with white icing to give it a cool effect.fill windows with yellow icing. Place witch on the top layer right above the house. Place moon top left of witch. Use toothpicks for ghost to stand put the toothpicks in very careful. Start putting ghost where ever you think is good. Use the grass tip for grass on the boarder of cake. Then grey icing to make side walk in front of door. Use orange icing to pipe around the rest of cake. 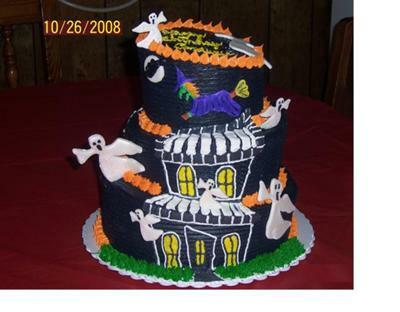 You can put some more ghost all over cake so when it turns you have decorations all over it looks really cool. This was my first time making this cake and I had so much fun with it.